A lot of times we fail to realize how important our loved ones are to us. During my thirty years with the Detroit Fire Department I took a lot of things for granted. While I was out there battling fires and sometimes putting myself at risk, my running mate in life, my beautiful wife, was manning the home front. It was not easy raising five children. We lived in the rough tough Delray area of Detroit. She not only had to put up with the stress of protecting our children, she had to put up with the stress of having a husband who was a Firefighter. During my career I was hauled to the hospital five times. Twice for stitches, twice for chemical exposure, and once for chest pains caused by exhaustion. My wife was at my side every time. She would hold my hand and help me through every ordeal I ever faced. When I got involved with the Firefighter’s Union, Local 344, she was there to help me. I eventually became president of the Detroit Firefighters Association and again my wife Jo stepped up to help. When we would travel out of town to attend conventions and seminars she would take charge of my directors’ young wives and would mentor and entertain them. She was a wonderful running mate who never complained and was always there to help. On February 8, 2009 my wife Jo passed away after a long fight with lung cancer. She died at home surrounded by her beloved children and husband. I lost my running mate in life. There was no glorious department funeral with long lines of uniformed Firefighters paying tribute. There was no procession with fire engines slowly moving by with flashers rotating and diesel motors giving off their low rumbling sounds. There was no pass by of an engine house with an empty pair of boots standing next to a line of saluting Firefighters. There was only a pair of flip flop slippers sitting in our bedroom closet. Jo was as much a hero as any of the bravest Firefighters I worked with. She was a part of me I cannot replace. When the kids went home I started to sort her things out. A lot of clothes went to charitable organizations. The jewelry will go the kids. One of the last things I found was the red skull cap she wore to keep her head warm during her last days. Cancer is meaner than any fire I ever faced. It not only kills you but it destroys your dignity as well. Jo lost all her hair. The skull cap was important to her. I picked up this last piece of my running mates gear and spotted a small gold pin which I had never really noticed before. What I saw made the tears flow like flushing a fire hydrant. It was a little gold Firefighter with angel wings. He was holding an axe and I know Jo wanted the Firefighters to be close when she passed. She was every bit a part of the Detroit Fire Department as I was. She was the best running mate I ever had. Jo was cremated and we will bury her in a little cemetery out in the rolling farm lands of northern Michigan. I am going to request that a fire rig be present. 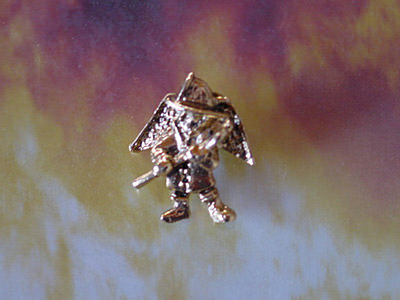 The little gold angel Firefighter will go with her. Like Firefighters, Jo made the world a better place.